Dot & Ziggy is Chicago Children’s Theatre’s first crack at targeting the baby and toddler audience—and, of course, those parents seeking a fun, interactive theatrical event to share with their youngest. Theater for the very young, age 6 months to 4 years, has been established in Europe and Australia for over two decades now and is just finding its audience in America, with Seattle and Minneapolis leading the way in baby and toddler theatre. Success for Dot & Ziggy could open the way to a whole new Chicago audience. 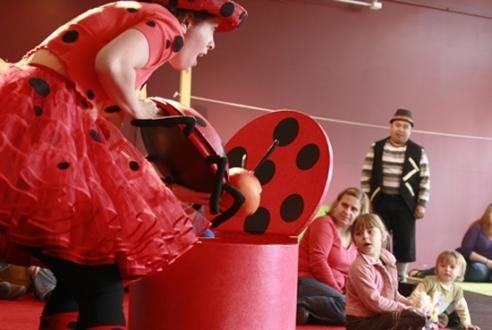 Created and directed by Linda Hartzell, Chicago Children’s Theatre also promotes Dot & Ziggy as childhood entertainment that doubles as “time well spent.” Clearly, the production was developed along early child development guidelines. The tried and true formulas first instigated by “Sesame Street” in the 1960s are all over this show. The production’s one variation from television lies in the moments it provides for interactive movement and sound. But the oft-repeated recognition of shapes, the recognition of opposites in language, as well as lessons on socialization – via the budding friendship between a ladybug, Dot (Roni Geva) and a skunk named Ziggy (Don Darryl Rivera) – are plainly safe, comfortable and predictable territory. Far be it from me, not being a parent, to throw cold water on a theatrical experience that might be exactly what some parents want for their children—something that fits easily into parameters they’ve already been exposed to at home. Obviously, the young audience’s response to Dot and Ziggy’s friendship forms a far better indicator. Geva is charming in the dedicated earnestness with which she tries to make Ziggy see things her way. Rivera employs a hint of cheerful mischief in Ziggy’s opposition to Dot. It’s also a plus that Dot and Ziggy lead the audience with music from the lobby of the Victory Gardens Biograph Theater to the upstairs theatre space. Once inside, Nicolas Davio’s fresh and simple musical accompaniment forms a strong underpinning to the storytelling. By far, watching the kids react to the material may be the show’s biggest entertainment value—an element that reinforces the communal nature of live theater, both for adults and the very young. I do question, however, an over-reliance on the Sesame-Street-model or an over-dependency on sociological approaches when it comes to creating theater, all with the intent that it be “good for children.” What can be lost is wonder; what results is a production that looks like it was created more by a well-meaning committee than by theater artists. Also, at some point, the question of whether parents really need to spend $16 a ticket to sing “The Itsy Bitsy Spider” with their children comes into view. Dot & Ziggy does have a very endearing original song near its end and one can only hope that further works for very young people, centered on greater originality and creativity, will be forthcoming. Chicago Children’s Theatre’s Dot & Ziggy continues through June 26th, with performances Tuesdays-Thursdays at 10am, Fridays-Sundays at 10am and 12pm. Tickets are $16 on weekdays and $18 on weekends, and can be purchased by phone (773-871-3000) or online. On Aug. 7, 1930, Thomas Shipp and Abram Smith were lynched in the town of Marion, Indiana. The two African-American men allegedly murdered a white local factory worker and raped his white girlfriend. Instead of allowing the justice system to weigh whether the men were truly guilty, the townspeople took the law into their own hands and tore down the jailhouse doors. Beaten and bloody, the bodies of both men were strung up on an tree. Studio photographer Lawrence Beitler managed to immortalize the horrific event, snapping a picture of the bodies swinging from the tree as a crowd of joyful onlookers stand below. Today, that picture serves as a powerful and grizzly reminder of the consequences of racial intolerance. No one knows precisely what events transpired that led to the charges against Thomas and Abram. James Cameron, a third black man initially identified as an accomplice to the crime, was spared from death at the hands of the mob. He would later state in interviews that he fled the seen before the murder took place. Marie Ball, the woman who was allegedly raped, would later testify that she was, in fact, never raped. This ambiguity makes the case of Thomas and Abram ripe for speculation. 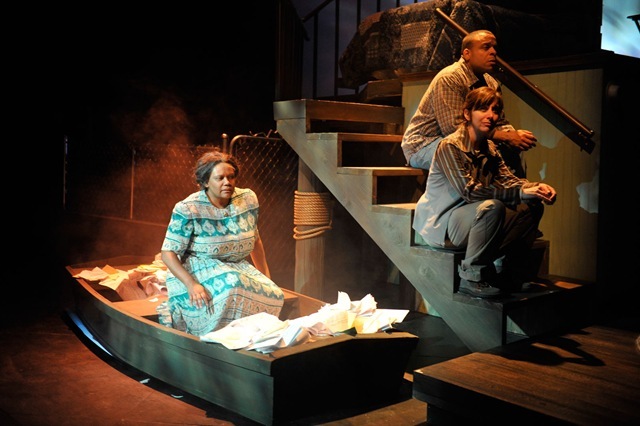 And so playwright Charles Smith has embarked on crafting a script that dramatizes what may have transpired throughout those days leading up to the lynching. What results is an intriguing work of historical fiction that wisely steers away from tired cliché and instead focuses on the inherent flaws of memory. 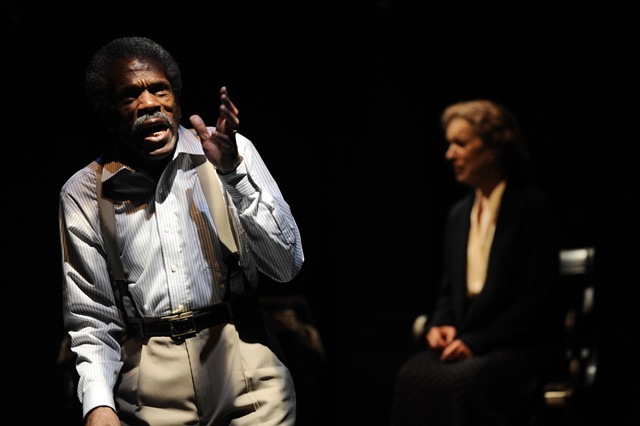 The play is about an imagined meeting between James Cameron (portrayed by André De Shields and Anthony Peeples) and Marie Ball (portrayed by Linda Kimbrough and Kelsey Brennan). Fate has brought them back to Marion. In the passing years, Cameron has taken it upon himself to be the vocal historian of that tragic night. His account parallels that of the real-life history of the event: Abram (Tyler Jacob Rollinson) and Thomas (Wardell Julius Clark) held up former foundry worker Claude (Zach Kenney), and before the murder occurred, Cameron fled the scene. But Marie does not remember it this way. She resents Cameron for spreading lies and threatens to reveal her version of the truth to the public. As Marie recounts her recollection of the events that led to that ugly night, we see her memories take dramatic form. According to her, Claude was hardly an innocent victim. James was more involved than he claims to be. And she and Thomas were much more than mere acquaintances. But despite her compelling account, Marie’s cognizance is called into question, and we are forced to wonder whose story, if anyone’s, is the real deal. The cast is captivating. 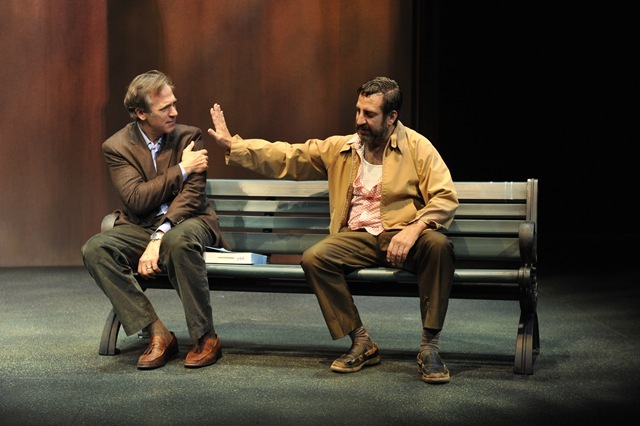 Shields is energetic and expressive as the aged James, while Kimbrough serves as an effective forlorn foil. 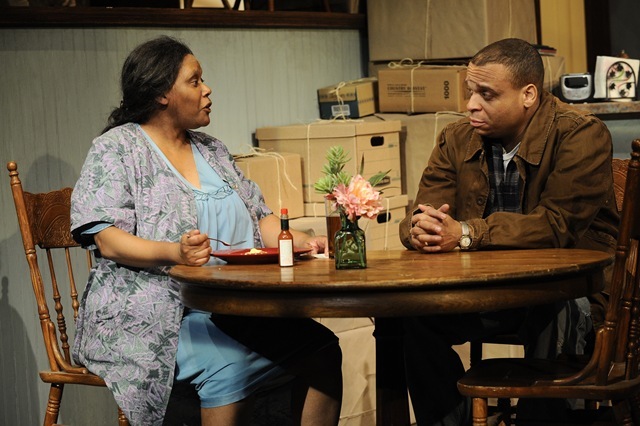 Meanwhile, the scenes between Marie’s parents (portrayed by Diane Kondrat and Christopher Jon Martin) are powerful, while Kenney is a believable slime ball. There is real chemistry between Rollinson and Brennan, which makes Abram’s lynching that much more heartbreaking. Peeples is the only odd man out here. His portrayal of the youthful version of James is cartoonishly juvenile. He speaks in a childlike tone and talks like an imbecile. This is a complete disconnect from the adult James, who is well spoken and refined. Smith is a smart playwright. He could have used the Marion lynching as a platform to soapbox about the ills of racism, a trite topic that always falls on agreeable ears. Instead, he focuses on memory and the subjectiveness of history. This is a much more interesting subject to parse, and he does a good job of portraying it dramatically. However, there are a few bumps in the script, particularly when the dialogue veers too far into poetry, creating a sense of melodrama. Victory Gardens’ production of The Gospel According to James is an engaging fictional account of a historical event. Despite its minor flaws, the solid acting and a strong script prevail, making it a thoroughly entertaining watch. What defines a family? Is it common blood? Shared experiences? 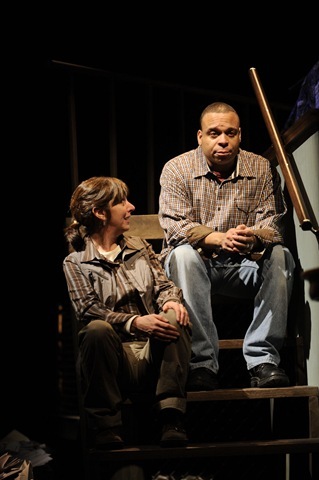 In Julie Hébert’s Tree, this is the major question South-side Chicagoan Leo (Aaron Todd Douglas) faces when his half-sister Didi Marcantel (Elaine Rivkin) tells him his biological father has died. 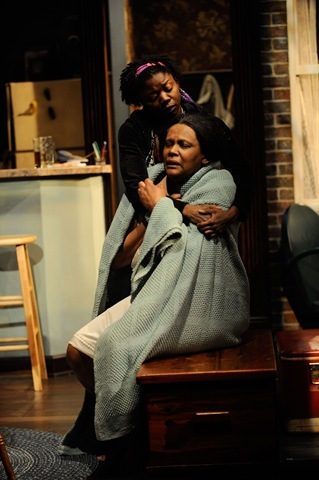 Didi has come up from Louisiana in hopes of retrieving the letters her father Ray wrote to Leo’s now-senile mother Jessalyn (Celeste Williams) when they were youths, hoping to find an emotional connection to her father’s past that was absent in their present relationship. As Didi tries to latch on to the last bit of family she has left, Leo’s contempt for his white father pushes her away, punishing Didi for her father’s abandonment. Anchored by a stunning central performance from Williams, Tree examines the effect one man had on the people he left behind, and how his death brings them together. 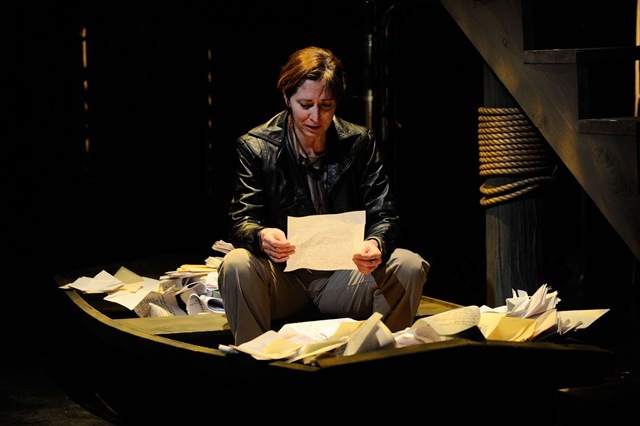 Hébert’s script combines lush lyricism with realistic, intellectual discourse to create a strong distinction between the emotional experience of Jessalyn remembering her letters with the conflict between Leo and Didi. In an incredibly difficult role, Williams does a complete transformation when she revisits her past, altering her voice and body to suggest a woman considerably younger. Although her exact illness isn’t revealed, Jessalyn shows signs of Alzheimer’s, experiencing the occasional moment of clarity but largely forgetful and confused. 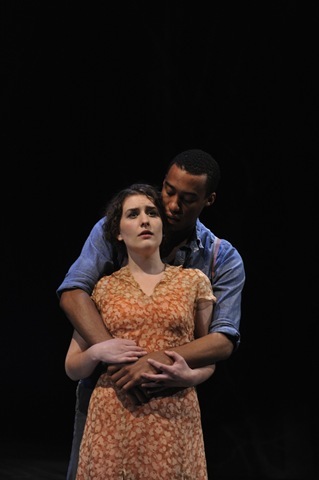 There’s a scattered energy to Jessalyn’s older characterization that becomes focused when she remembers Ray, and the audience is transported by Hébert’s rich imagery and romantic prose, making the reality of Jessalyn’s illness all the more heartbreaking. Williams’ performance takes us inside the car where she had her first accident (without a license) and to that all-important lake where Ray snuck into the tree without her looking. 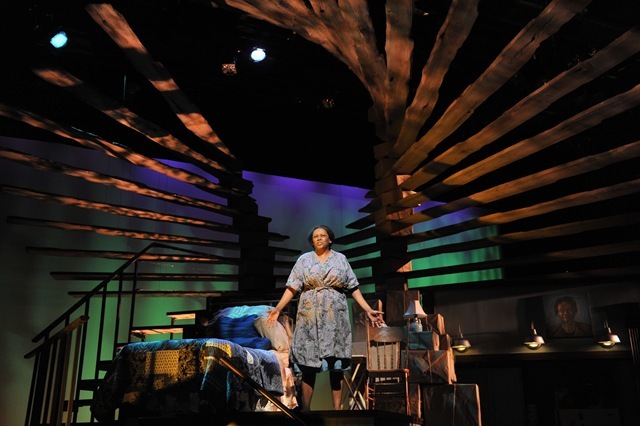 We fly and fall with her, and she’s the standout in a production full of stellar performances. Race relations are a large part of Tree, but they never overshadow the larger theme of family. 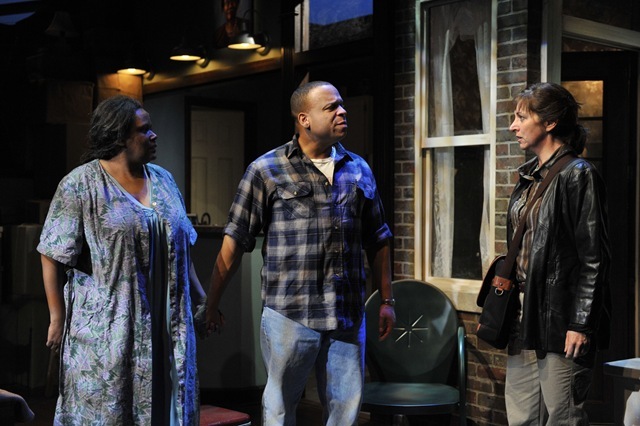 It reminds me of another great play from this season, Route 66’s Twist Of Water (which reopened this week at the Mercury Theatre), sharing a Chicago setting along with a similar ability to tackle racial and gender issues in that is smart but still emotionally powerful. They’re both concerned with finding a definition of family that goes beyond the traditional ideas, and perhaps most significantly, they’re both very funny. 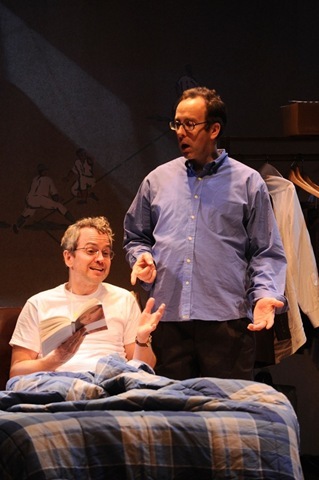 More than anything, these plays are saved from melodrama by the humor the playwrights put in the script. Watching fish-out-of-water Didi try to adapt to Leo’s South side hospitality is consistently amusing, and Rivkin’s sweet, amiable portrayal of the good-natured Didi makes Leo’s lashing out against her especially unfair. Douglas captures the pain that lies underneath Leo’s anger, but his character flaw is that he is constantly jumping to conclusions without all the facts. Didi is trying to connect with her half-brother, the only blood kin she has left, and Leo accuses her of needing to assuage her white liberal guilt. He passes judgments on her lifestyle without any real knowledge about it, but can’t take it when Didi dishes it right back at him. The two performers have wonderful chemistry together, and they aggravate each other so easily it’s easy to see a sibling resemblance. Leo, Didi, and Jessalyn are all looking for a Ray Mercantel that doesn’t exist anymore, and their frustrations push them to react aggressively, both in positive and negative ways. Didi pushes a relationship on Leo, Leo forces Didi away, and Jessalyn – well, you never know what Jessalyn is going to do next. 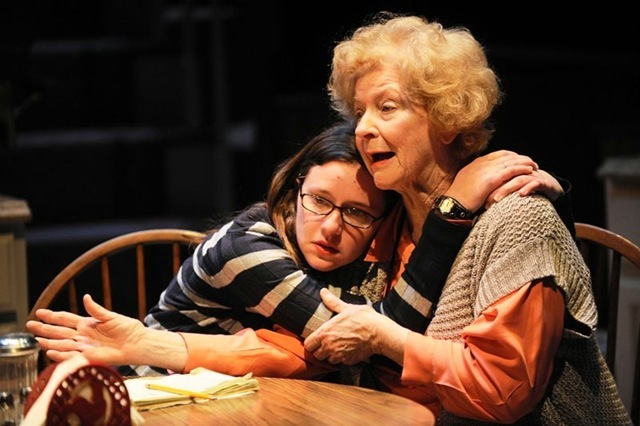 While the older characters are reeling from Ray’s death, Leo’s daughter JJ (Leslie Ann Sheppard) serves as a witness to the growing instability among them and a voice of reason in the emotional whirlwind of Leo’s home. The consistently wonderful Sheppard gives JJ a cheerful disposition that is immediately welcoming, but she also gives JJ some grit. She doesn’t share her father’s prejudice toward Didi, but when Didi starts snooping around for Ray’s letters, JJ goes into a rage that reveals how protective she is of her fragile father and grandmother. Andrea J. Dymond directs a deeply moving, incredibly funny production (seriously, Jessalyn gets some amazing one liners) with an integrity in acting and design that elevates Hébert’s script. 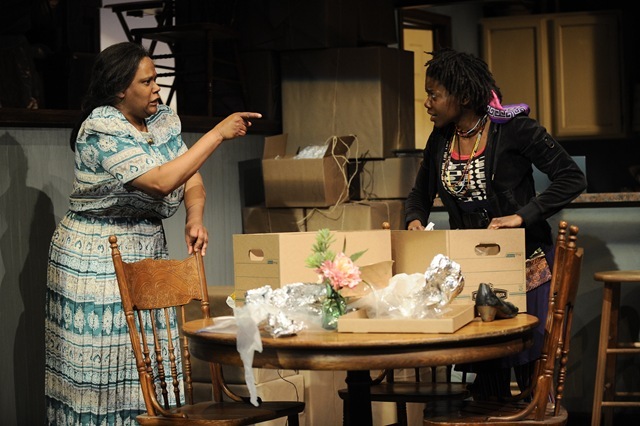 Jacqueline and Rick Penrod’s set design evokes the title of the play with fanned wooden planks above the actors and a stack of boxes creating a tree trunk through Leo’s home, making Didi’s inspection of the containers a literal dig through her family roots. Charlie Cooper’s lighting evokes the different settings of Jessalyn’s monologues, and beautifully reflects her changing moods, switching from cool blues and warm oranges for her past to stark red for her most extreme moments of confusion and terror. All the elements combine for one powerful examination of the meaning of family, and in the end, family is who will be there for you when times are hardest. Family isn’t blood or experience, it’s compassion. Because the recession has foreclosed so many homes, a lot of “boomerang kids” have returned to the nest–to the confusion of parents who thought they’d seen the last of them. It’s even more poignant if, 30 years after they supposedly left home, two middle-aged guys have returned to the sender, so to speak. That’s the bittersweet case in The Boys Room, Joel Drake Johnson’s moving portrait of two stunted sons and their arrested development. 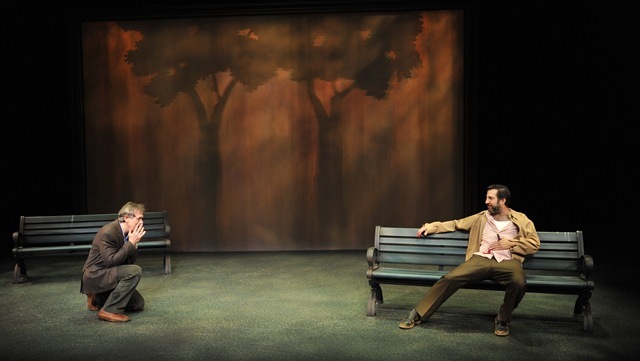 A Victory Gardens Theater world premiere richly staged by Sandy Shinner, this 90-minute slice of loss exposes the longings of two brothers’ midlife crises. Then there are the women—a mother and a son’s daughter—who contend with the brothers’ dangerous nostalgia (or regression) for their safe, secure upstairs bedroom. This is not your usual dysfunctional-family dark comedy where sitcom crises mount with the laugh track, only to have recriminations replaced by reconciliation. Johnson has a great ear for loud desperation and the self-sustaining logic of failure and the pitilessness of pity. There are no happy resolutions here, just simple survival. That makes this play far kinder to its audience’s collective intelligence than all the wishful thinking that makes for second-act hugs and unearned happy endings. Shinner’s staging is equally grown-up. There’s obvious humor in two loser husbands turning back into whining boys, reenacting old games that made them feel safer and wanting mommy to make everything right. But Key’s Tim is far too damaged to be healed by memory-mongering, while Dempsey’s explosive Ron is paralyzed with self-loathing. Forward facing where the men are sinking into a bogus boyhood, the women are far stronger souls. 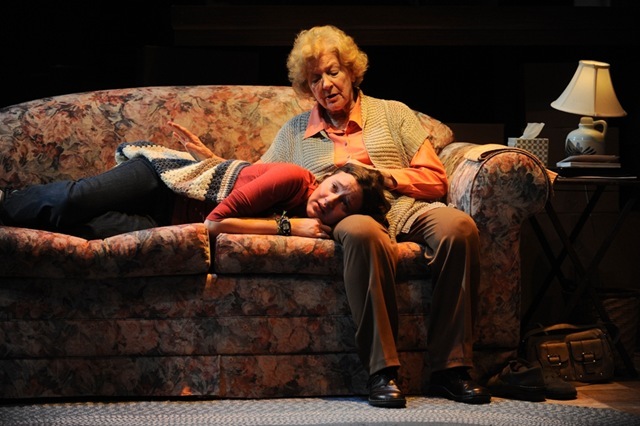 Thebus’ tough-loving Susan is a rich mix of resilience and resignation, unwilling to indulge this second childhood one second more than she needs to. Equally remarkable, Torem’s anguished adolescent conjures up all the collateral damage of broken homes and makes it as specific as a scream. 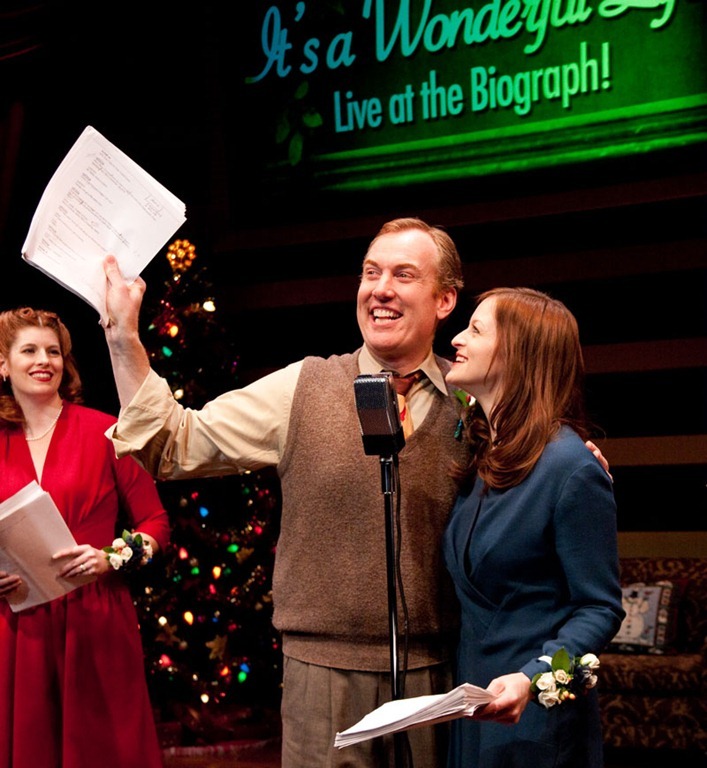 It’s a Wonderful Life: Live at the Biograph! Now it’s a worthy Chicago Christmas celebration in its own right. American Blues Theater gifts us with a pitch-perfect recreation of WABT’s Christmas Eve presentation of the story of one man’s salvation from suicide by a clumsy angel who wants to win his wings. This powerful blast from the past is performed in impeccably accurate 40s wigs and costumes by an unimprovable cast of Chicago pros at the collective peak of their careers. It’s feel-good theater with a conscience, not to mention a sing-along before and during the radio show and commercial jingles for local enterprises. The story–about a bad bank (and slumlord/banker, Mr. Potter) that doesn’t “trust” or invest in its struggling community of Bedford Falls but is ready for a foreclosure whenever it needs a cash infusion–has never seemed so contemporary. An embattled savings and loan director, George Bailey (a bumptious and passionate Kevin R. Kelly) and his adoring and empowering Mary (Gwendolyn Whiteside) clearly make a difference in the world and for the folks around them–even, or especially, when times are hard. That’s when folks without health insurance or with heavy mortgages and bills need all the safety nets their neighbors can provide. This difference that he makes, of course, George foolishly doubts and denies–until Clarence (incredibly deft John Mohrlein, who ranges from klutzy Clarence to vicious Mr. Kirby at the drop of a script page) shows him how Bedford Falls would have degenerated into Pottersville if George had never been born. The ripple effect, which means that no man is an island, has never been more gloriously depicted than in this reverse “Christmas Carol,” where Ebenezer/George discovers how his absence would be even more destructive to the world than his presence. All of this wonderful “Capra-corn” is presented in a seamless 90 minutes, with piano accompaniment by Austin Cook and ingenious Foley effects by Shawn J. Goudie. The nine-member ensemble deliver crowd noises, sound effects, songs and, above all, sincerity. The result is an authentic radio-days recreation that could pass for the real thing, but, even better, works perfectly as a play. It’s a wonderful show! 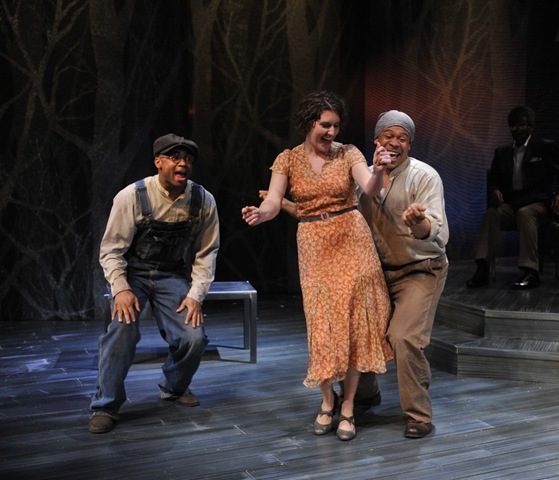 The inaugural production of new company Chicago Muse, The Story of My Life was voted the best new musical of twelve read by a committee of theater patrons and professionals. Walking out of the Biograph Theater, I couldn’t help but wonder what those other shows were, that they couldn’t beat Bartram and Hill’s uninspired musical. 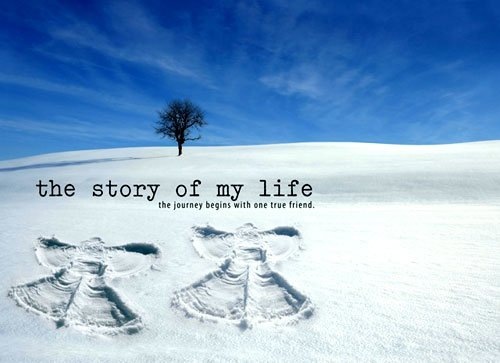 Chronicling the friendship between recently deceased Alvin (Davis Duffield) and his estranged best friend Thomas (Jack Noseworthy), The Story of My Life tries to fit as many clichés as possible in its 90 minute running time. Thomas, a renowned novelist, struggles to write Alvin’s eulogy, and as he recalls the history of their relationship he learns to appreciate the role Alvin played in his creative success. The characters share an affinity for Frank Capra’s “It’s A Wonderful Life” and Mark Twain’s “The Adventures of Tom Sawyer”, and the show’s book is heavily influenced by both iconic American creators. Alvin and Clarence are Clarence and George, watching the events of the past, or Huck Finn and Tom Sawyer, secretly spying on funerals. What they’re not is captivating characters, and their relationship is as unbelievable as it is unoriginal. Once the pair grows into adolescence it becomes difficult to believe that the charming, collected Thomas would maintain a friendship with the socially awkward Alvin, who still dresses as the ghost of his dead mother for Halloween (yes…still). As adults, the two men sing songs about butterflies and snow angels to recall the times they shared as children, but the result is so cheesy that it’s hard to take seriously. The conflict of the latter half is basically the two falling out of touch because Thomas avoids Alvin, which doesn’t translate to very compelling theater yet takes up a large chunk of time. By the time Thomas finally realizes Alvin was his inspiration all along, which the audience knew five minutes into the show, the production has already lost most of its momentum, despite the efforts of its talented stars. Both the story and music of The Story of My Life owe much to Stephen Sondheim’s Merrily We Roll Along and Sunday in the Park with George. Merrily’s theme of friends and their influence on an individual’s creative growth is combined with Sunday’s meditations on the limits artists place on themselves, and both shows’ musical themes are reflected in Bartram’s score. 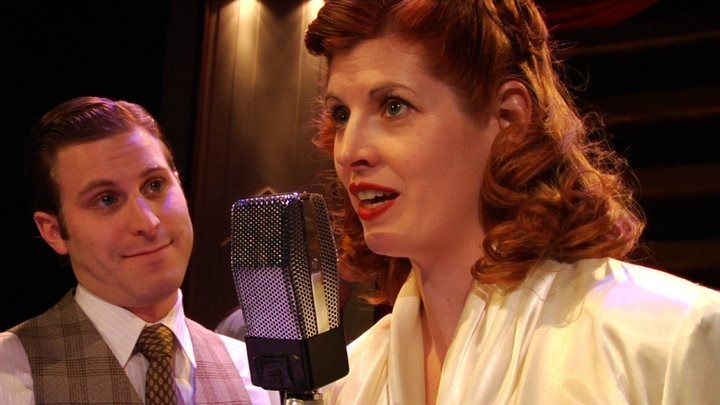 The general lack of originality drags down the show, even though.Duffield and Noseworthy are capable performers, with Noseworthy hitting some particularly difficult notes with fantastic clarity and power. They try their hardest to make their characters realistic, but the source material’s flaws overcome their respective efforts. While the two actors never miss a beat, the beats are so derivative that, unfortunately, their talent is wasted. Check out Chris Jones’ article about acclaimed composer (and musical director) Richard Maltby Jr.
“You are very good in bed,” a wife tells her husband with imploring sincerity during the Edward Albee’s Homelife, “I just wish you’d be bad once in a while.” So goes the one-act piece’s conversation of domestic crisis, an emotionally complex and elegantly worded discourse between a long-time couple, deeply in love with each other and deeply restless within lives of sheltered security. 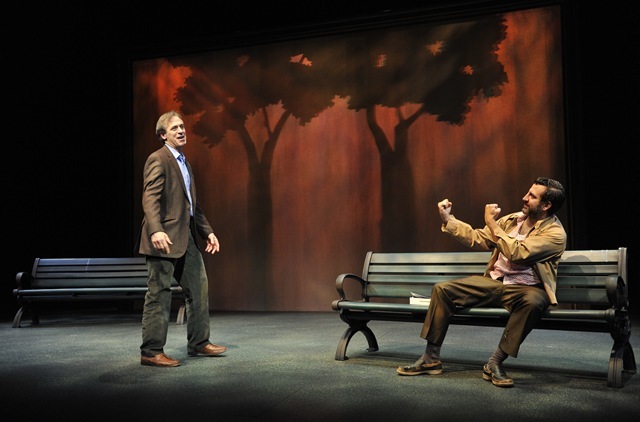 By pairing Albee’s new work Homelife with his career-launching The Zoo Story, the Victory Gardens Theater creates a mostly fascinating evening. Alone, The Zoo Story is a harshly compelling, self-contained cryptogram of a play – nasty, brutish, violent and short and embedded with disturbing questions about the origin of its violence. Seen with Homelife, The Zoo Story receives a rich, contextual background that makes the piece blaze with heightened immediacy. To see The Zoo Story is to recoil in shock as an encounter on a Central Park bench moves from civilized pleasantries to bestial bloodsport. The transition is both inexorable and unexpected. With a final, stabbing climax, Albee makes his audience confront more than a few scary concepts. Among them: The tragic fruit of incurable isolation and the disquieting notion that for some people, the world will always be an unwelcoming and awful place. Then there’s the whole idea that no matter how well you insulate yourself – no matter how carefully you cocoon yourself with the trappings of a stable home and family and career – you cannot protect yourself from random outbreaks of life-altering chaos. Your well-appointed home, loving wife and pleasant career can’t save you from mayhem. Directed by Dennis Zacek, both Homelife and The Zoo Story (produced together as “At Home At The Zoo”) make for a provocative production. The primary problem with the evening is that Homelife is more of a prolonged set-up for The Zoo Story than a drama that can stand on its own. 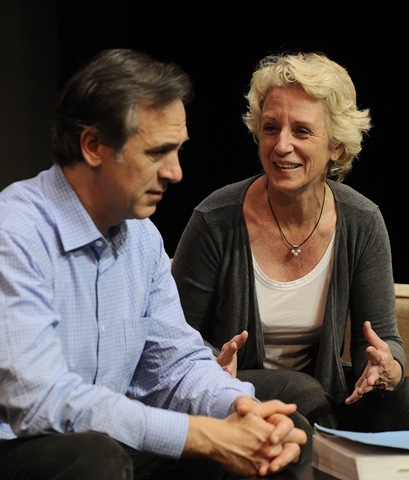 Even so, the issues of the upper-middle class white couple Peter (Tom Amandes) and Ann (Annabel Armour) are delivered with sharp-shooter precision straight to the core of the heart. Armour’s Ann captures the yearning dissatisfaction of someone trapped in a gilded cage, a spirit so completely tamed that only a flickering spark of its original self remains. That spark, however, is enough to ignite a wildfire of discontent. When Peter protests that the couple long ago made a decision to live their lives as a “pleasant journey,” and to “stay away from icebergs,” Ann counters that decades within that safety have left her pining for something “you can’t imagine,” something “terrifying, astonishing, chaotic and mad.” That yearning is exquisitely rendered by Armour. Live your life as a placid and wholly secure voyage, Ann notes, and you never even really die – you just sort of “vanish.” There’s undeniable terror in that view of the end: Is there anything more scary than the prospect of reaching the end of your life only to realize you’ve never fully lived it? 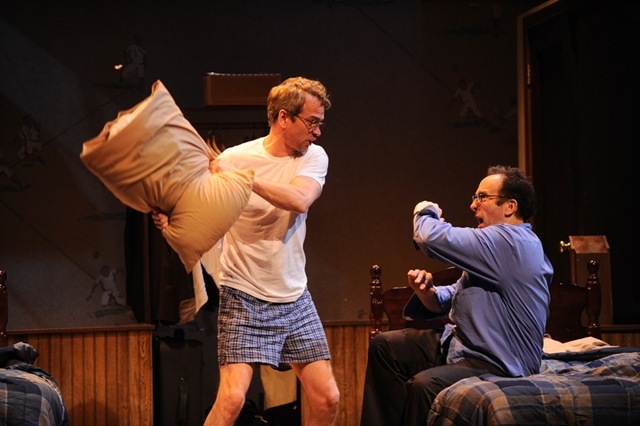 In Homelife, Albee convincingly argues that there is not. Yet for all the incendiary dialogue of Homelife, “A Home At The Zoo” doesn’t fully start clicking until its second act with The Zoo Story, when Marc Grapey bursts onto the stage as the unbalanced Jerry. He’s a hilarious loose cannon as the sort of crazy New Yorker whose tone of voice falls just short of overt menace and whose overall presence is both clownish and embedded with an unmistakable threat of implicit danger. Albee’s contrast between Peter and Ann – a couple so sheltered they’ve lost all track of their own, authentic cores – and Jerry, whose raw exposed soul is buffeted on all sides by the world’s unkind wildness – is striking and vividly depicted by this pitch-perfect ensemble. 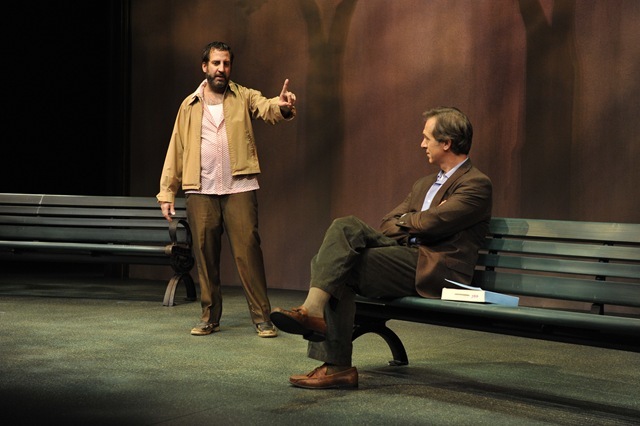 As Peter, Amandes is the very soul of quiet desperation – until he’s not. When Peter finally unleashes the primal howl that he’s squelched for years, the moment is one of supreme destruction and catharsis. Armour’s Ann is equally powerful in a more subtle manner, mining deeply rooted dissatisfaction and plumbing the fearsome depths of subconscious with intense bravery and dogged effort. And then there’s Grapey, spinning a world of lucid delirium (not as paradoxical as it sounds) and forcing Peter to let loose the great and terrible beast within. It’s a powerhouse performance, a whirlwind of tragedy and comedy, of inconsolable sorrow and impish playfulness. Zacek sees that the cast makes the most of Albee’s profound and lacerating dialogue, shaping the trio into a tight-knit ensemble leading its audience into confrontation with some of the darkest pockets of the human condition.